December can be a very expensive month. There are gifts to buy, parties to attend, festive dinners to whip up, dozens of cookies to bake, Christmas cards to order, AND let’s not forget the cost of postage! I’m not advocating anyone to over-spend or buy things that we wouldn’t normally spend money on this month and holiday season, especially if we don’t have the funds. However, December is a great time to find deals on basics, food, and things that you might need and/or use throughout the year. 1. Find the FREE holiday adventure. There are so many free opportunities this month for holiday fun. Check the events calendar of your community, library, mall, and places of worship. I’ve seen free museum days, nativities, parades, Santa, and more in my community. 2. Stock up on the grocery deals this month. This is the best time of year to buy on canned goods, turkeys, hams, winter squash, cranberries, and baking supplies, such as flour, sugar, chocolate chips. Plan your menu around these sales, and stock up for your pantry and/or freezer. As an incentive to buy gift cards, many retailers and restaurants offer bonuses in December. These bonuses could be an extra gift card, free product, or extra rewards points. We give restaurant gift cards to extended family members as gifts and try to find the best bonus deals. Or stock up on gift cards to places that you frequent often during the year. Our favorite smoothie place offers a free smoothie with $25 gift card purchase. Giant of PA has offered up to 4 times the gas points on selected gift card purchases. Do you send out Christmas cards through snail mail? Honestly, I’ve stopped and I’m still conflicted by it. I enjoy receiving Christmas cards from others and I reminisce of years past when the mailbox was full of them from friends and family near and far. It’s gotten expensive with postage and the price of cards, and since we’re trying to save money and cut costs, I’ve stopped mailing them. Also I’m active on my personal Facebook page, so I see my friends’ pictures every day. 5. FREE shipping day is December 15! I suspecct many stores will make a big deal on this final push for online holiday sales. After the 15th, you take a chance that gifts won’t make it to the destination in time for Christmas. Don’t forget to use Ebates, an online rebate portal, when shopping online. 6. Take advantage of the Clothing (Basics) Deals! I stock up on undergarments, socks, and other basics this month. I find these things are marked down more than usual. My favorite place to shop right now is Kohl’s when they have additional percentages off, plus the opportunity to earn Kohl’s Cash. December 26 starts the holiday clearance frenzy. This is probably my most favorite time of year to shop. I scour the stores for clearance goodies, and I mean SCOUR! I not only stock up for next year’s holiday decor, stationary, gift wrap, etc, but I look for deals on everyday items that are marked down simply for having holiday packaging, such saran wrap, soaps, detergent, etc. Target is my preferred clearance destination and I usually do my final sweep of Target on January 1 at 8 am when everyone else is snoozing in. Target has definitely changed their clearance policy over the years, but they are usually at 70% off by January 1. On January 2, I’m done with the holidays, but there are still clearance deals to find. Don’t limit your clearance shopping to just one store. Be sure to check your grocery stores, Target, Kmart, Wal-Mart, CVS, Rite-Aid, Walgreens or any other store in your location. My favorite is Target. Look for seasonal or holiday packaging on everyday items, like the Halloween themed Glad bags or the penguins on the Electrasol dish washing tabs. I have found all sorts of everyday items that have holiday packaging: paper towels, crackers, hand soap are a few other examples. Search the entire store, not just the holiday themed aisles and the end-caps. These products might be in the everyday aisles and unmarked. Keep your eyes open. Use the price scanner. Sometimes clearance isn’t signed or ticketed properly, so use the scanner to be sure of the price. Target’s clearance schedule is typically 30- 50% off the day after the holiday for three days, 50-70% off the fourth day after the holiday for three days and 70-90% off the seventh day after holiday, for 1-2 days. This schedule isn’t set in stone and it could vary by region. You could always call the store during this time for the specific percent. If you have some time during December, start planning for tax season by organizing receipts, statements, and other paperwork you will need to file your taxes. What are your favorite ways to save in December? Let us know in the comments. 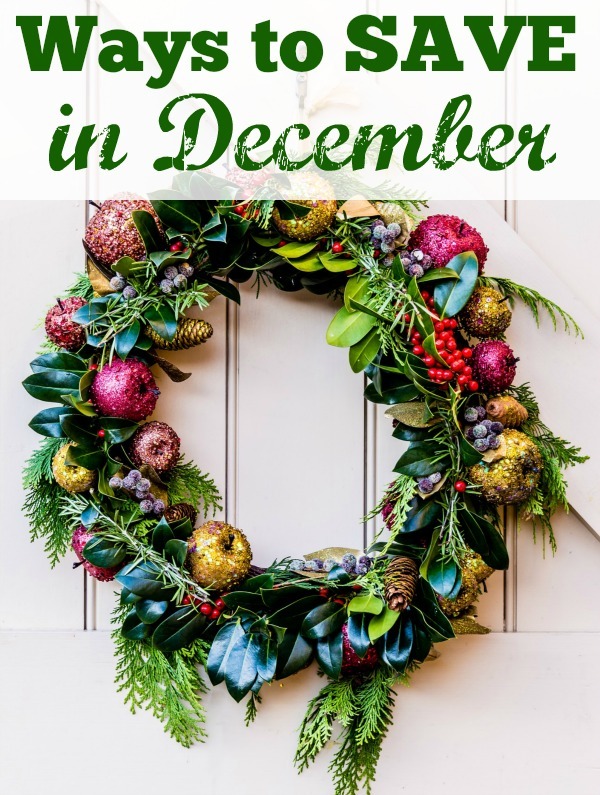 Great ideas for saving in December! This can be such an expensive month can’t it? Thanks for including my post about making your own photo cards. I hope this will be a helpful option for cutting down on Christmas expenses this year. Merry Christmas!